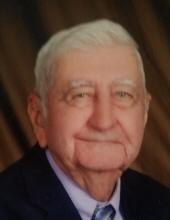 Leslie Travis Gardner, 85 of Jamesville died Friday, January 18, 2019 at his residence in Jamesville. Born November 19, 1933 in Martin County he was the son of the late Enoch William Gardner and Irene Stallings Gardner and was preceded in death by his wife, Sally Hoggard Gardner; son, Eric Christopher Gardner and brother Bobby Mitchell Gardner. Leslie was a retired farmer, a U.S. Army veteran of the Korean Conflict and member of Cedar Branch Baptist Church. His family includes his daughter, Kathy Gardner Davis of Jamesville, N.C.; sons, Randy Travis Gardner and wife Terry and Kelvin Mitchell Gardner and wife Donna both of Jamesville, N.C.; fifteen grandchildren and twelve great grandchildren. Funeral service will be held Monday, January 21, 2019 at 2:00 pm at Cedar Branch Baptist Church with Joseph Seay and Wayne Ellis officiating. Burial will follow in Jamesville Cemetery. Family will receive friends on Monday, January 21, 2019 from 12:30 to 1:30 pm at Cedar Branch Baptist Church and other times at the residence. Flowers are welcome or donations may be made to Kennedy Baptist Children's Home. "Email Address" would like to share the life celebration of Leslie Travis Gardner. Click on the "link" to go to share a favorite memory or leave a condolence message for the family.